In Mexico this tripod is referred to as "tripodo gigante" It's a big boy -- you could put a Mini Cooper on this thing and it wouldn't flinch. 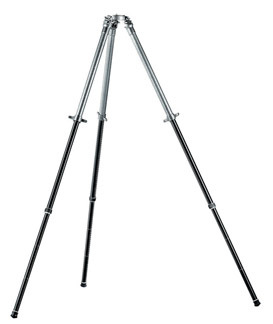 No matter how big your lens or camera is, this tripod is up for it. Canon 800mm, in sand, during a windstorm? This is the kit to have. It comes with a flat tripod head mounting plate with a reversible 1/4"-20 & 3/8"-16 screw, but you can optionally add a rapid, geared & short center columns as well as a leveling base. The Induro AT413 legs are just as thick and it actually supports more weight than the Gitzo, but the legs are an aluminum alloy that don't have the same heft as the Gitzo. You will need a tripod head in order to use this tripod. If you are renting a large super-telephoto lens, we highly recommend you have something like this so that this does not happen to you.